St. Sophia’s Cathedral (1037) is the most vivid example of the Old Rus architecture and monumental art for this place, was built and decorated when the state of Kyiv Rus was living through the peak of its prosperity. Here grand princes were crowned and buried, formal ceremonies and receptions of envoys were help, the first known library in ancient Rus and the first school for boys and girls were founded by Yaroslav the Wise. 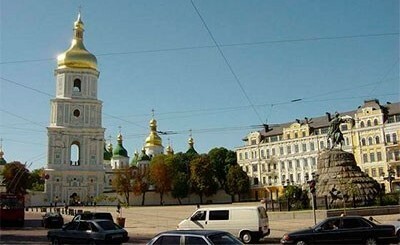 The Cathedral was known as a seat of Kiev Metropolitan. The interior has survived from the 11th century and there have been practically no alterations. Mosaics and frescos of the 11th century, executed with a unique technology, which depict Scriptural scenes, individual figures of Church Fathers, Apostles, warriors and maidens, are of a great value.